LED light fixtures have a range of benefits: reduced energy consumption, smaller than traditional light fixtures and are available in a wide range of colors. 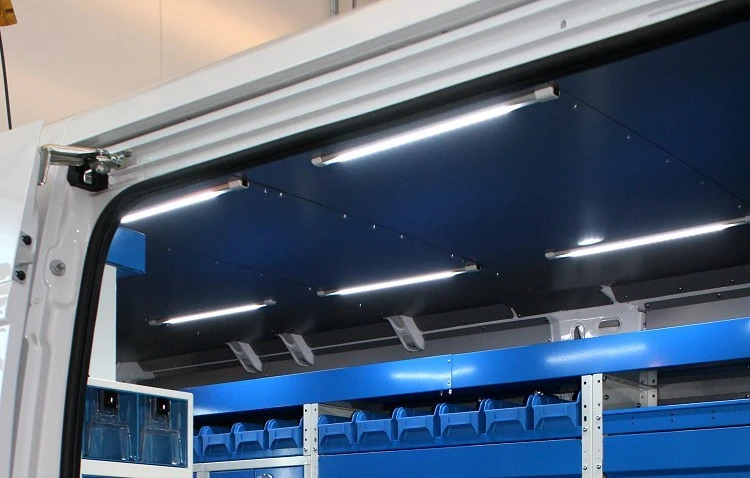 Among the wide range of models that Syncro System offers, there are two similar ceiling lights differing in size, power and energy consumption. They both give off a bluish light with a color tone similar to sunlight. The lights have a convenient touch sensitive switch: you only need to brush over it to turn on or off the light. 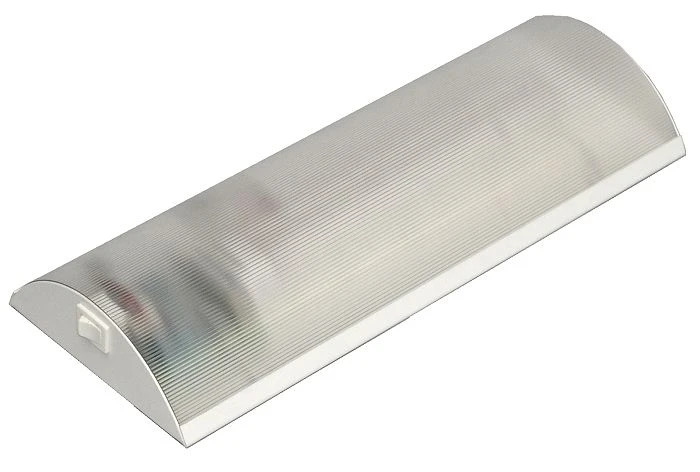 The light diffuser on the front plate of the ceiling light avoids bothersome glare generally associated with high output LED lights. 12 Volt power supply makes it possible to connect directly to the battery of the van. 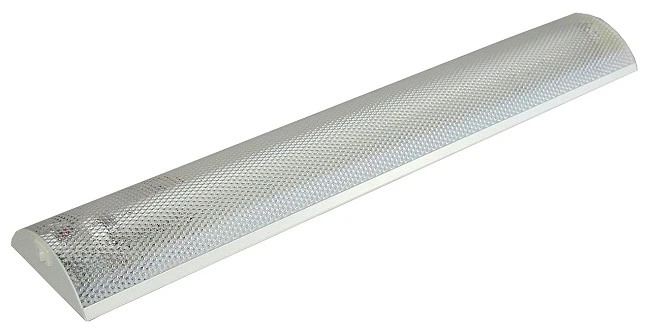 LED100 1 meter long and has a 15W energy consumption rate. Because of their smaller size, they take up much less room on the ceiling of the van, increasing manuverability in the cargo space. 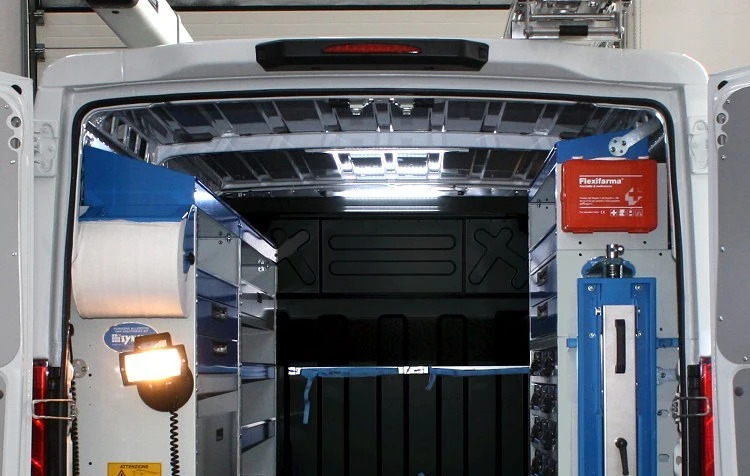 One of the common requests of our Syncro System upfitting customers is to add adequate lighting in the cargo area of their vans. Commercial vans, usually come with small dim lights, not adequate for the needs of our clients. In addition, they are often placed inconvienently in corners or along the mountings, often creating problems with the positioning of the upfitted systems. 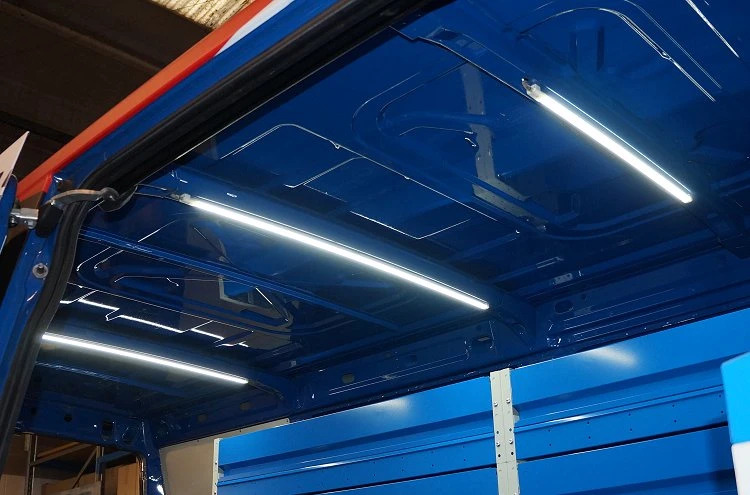 The Syncro System neon lights are created specifically for upfitted van systems: emmiting a bright white light that's not harsh on the eyes, thin profile design that allows you to install them easily to the ceiling of the van or wherever extra light is needed. 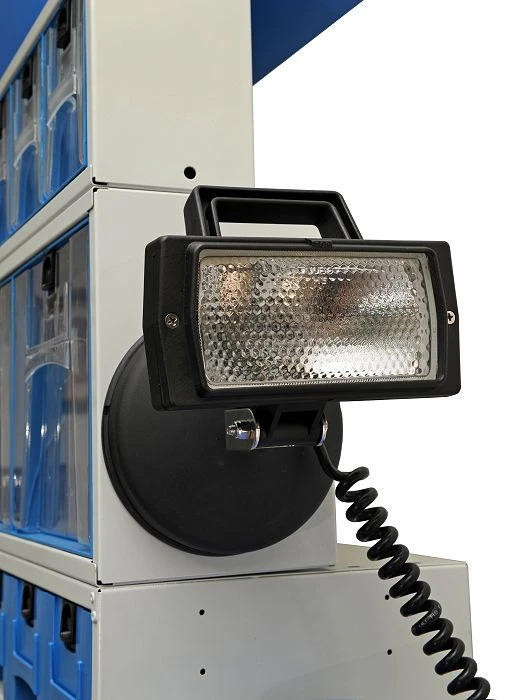 The Syncro van lighting fixtures use normal flourescent tubes from 220 V, but thanks to their electrical ballast they can be powered by the 12 V van battery. The built in on/off switch is clearly visible. Because of their low energy consumption, no extra precautions need to be taken to install them. Let's take a look at how neon lights can be used in your van. Thanks to low energy consumption, it is possible to install a few neon lights without causing excessive draw on the van's battery. The lights can be turned on and off seperately, depending on when and where light is needed at moment. The light produced is a soft but bright pleasant light. 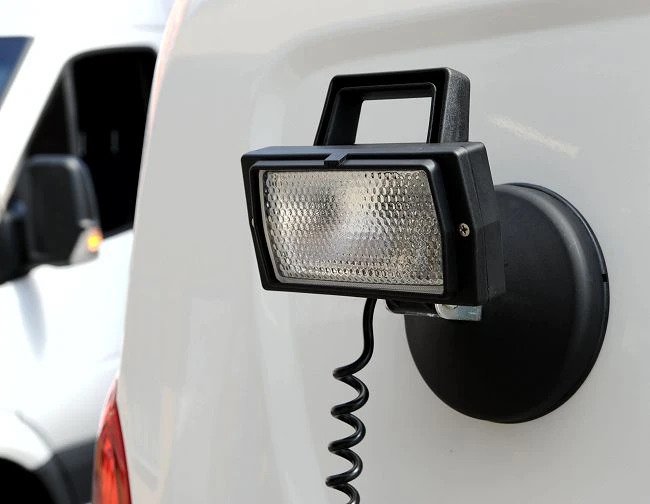 The rotating beacons for vans are extremely useful to signal that the van is working on a constuction site or on the street. 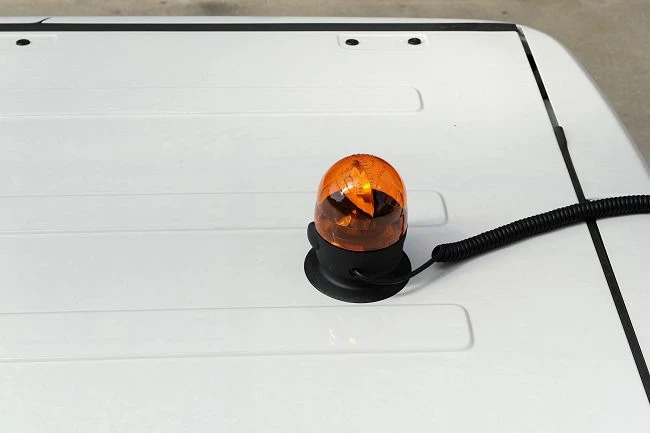 The magnetic base allows you to place the light where you need it: on the side or on the roof of the van. While driving, the light can easily be attached inside the van. The coiled electrical cord plugs into your van's 12 Volt cigarette lighter socket that are factory-installed in all vehicles. For commercial vans that need to illuminate the exterior of the van, Syncro System offers powerful 12 V halogen floodlights. 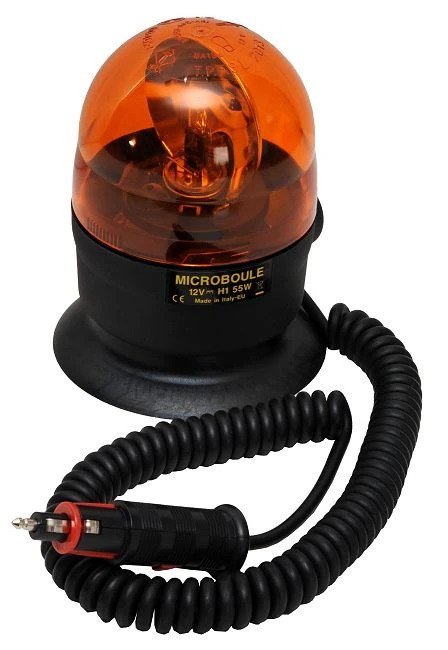 These lights are available with a magnetic base or a base that can be permantly mounted to the van. 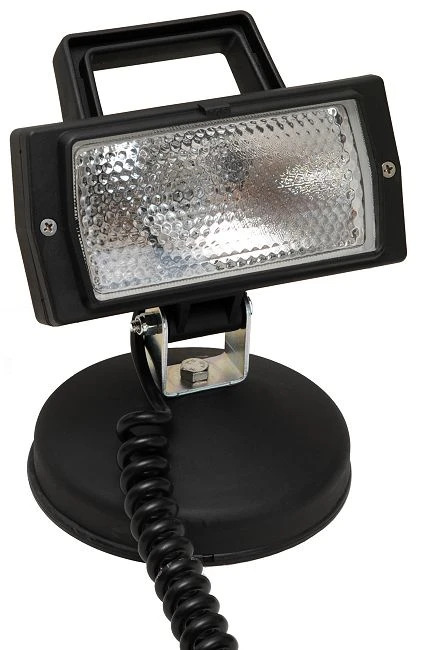 The floodlight with magnetic base is supplied with a coiled cord and cigarette lighter socket plug. 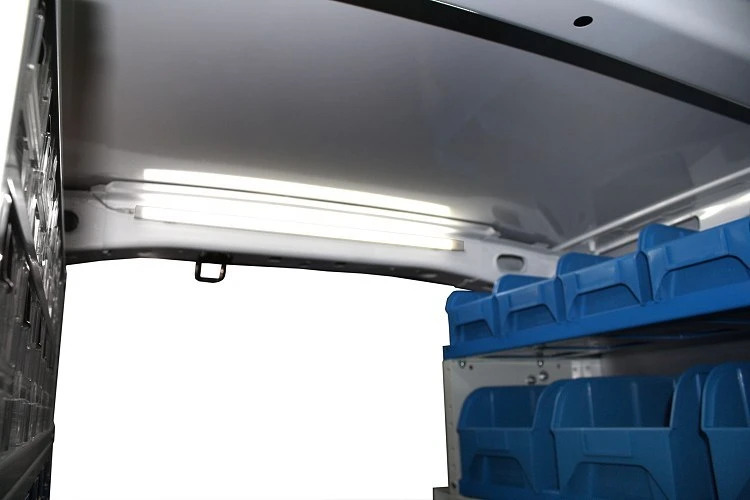 It can be placed either inside or outside the upfitted van, providing a strong bright light where you need it most. All vans and commercial vehicles are equipped with 12 Volt cigarette lighter socket in the cab. 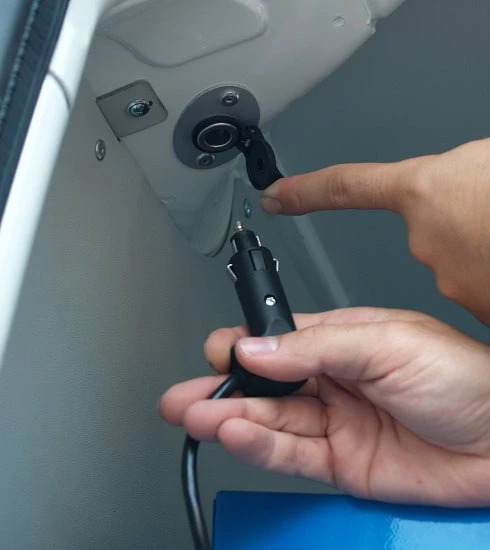 Among the many Syncro accessories, you can also find 12 Volt sockets that can be mounted in the cargo area: to upfitted panels or directly to the body of the van – where ever it is most convenient to access. With the lighter socket accessory, you can plug in the headlight or any other 12 Volt accessory or equipment.